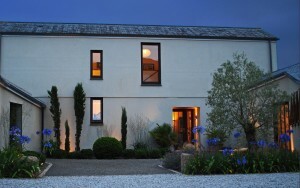 Planning exterior lighting often comes low on the agenda of self-builders new-build projects. Here lighting designer Claire Pendarves gives some tips and advice on planning your garden lighting. The more you plan the better the effect. If you’re not a keen gardener and don’t have a basic plan in your head then I would strongly advise bringing in a professional landscape architect or garden designer. So often I see the landscape design being left as an afterthought and although it’s workable, especially if the coffers are running low, it can mean that the project can seem half finished for a number of months or even years. Francis Bacon said “In order for the light to shine so brightly the darkness must be present” and this is so true when it comes to lighting our gardens. An over-lit garden can seem flat and dazzling whereas careful placement of exterior fixtures can make it seem quite magical. Also, I find that the lighting budget for a new-build can balloon by over-specifying on the exterior landscape lighting quite unnecessarily. When you consider the British climate we spend most of our time in our houses and sadly the evenings where we are relaxing in warm summer gardens are all too few. 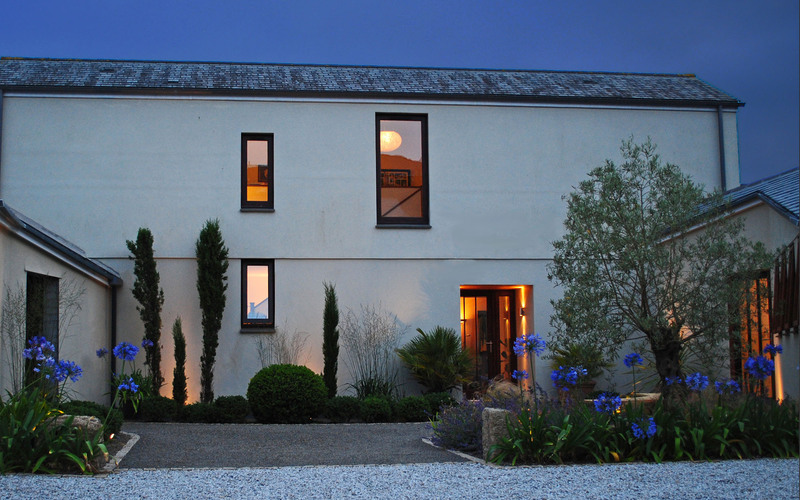 With so many new-build designs featuring large expanses of windows and the trend being to connect the design of the interior and exterior spaces it makes sense to consider how the garden lighting will look from the inside. Accent garden lighting placed near the house can visually extend the living space and relieve the cold appearance of black glass panes at night making occupants feel less vulnerable. Take a critical look at your building and planting to see what existing features you can highlight. Rough stone walls take on a magical warmth when uplit with low glare inground LEDs as can well-structured trees and shrubs. If you’re struggling to find any existing features this could help you decide on your planting; palms, silver birch and olive trees for example light well and oversized lit planters can look stylish and dramatic. 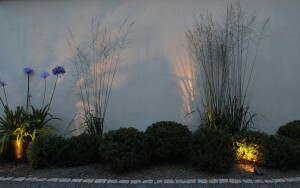 I always think of lighting as a journey and nowhere more than when lighting routes within a garden where functional lighting should dovetail with the aesthetic. Consider the approach from the parking area, unloading shopping on a winter’s evening and the trail up the garden path to the enveloping warmth of home. It is particularly important to select low glare fittings for all paths and steps ensuring that the route is smoothly lit with no dark patches on the way. There is no doubt that exterior lighting can bump up the cost of a project but it is a lamentable mistake to buy cheaper fittings with the aim of stretching the budget further. If the bottom line is looking too inflated it is better to choose fewer fittings and still stick with quality. Beware of stainless steel as there is a vast range on the market and I’ve seen cheap fittings corrode within six months near the coast. Go for 316L stainless steel or galvanised when selecting steel; alternatively copper is incredibly resilient and tones down well and bronze is practically indestructible. Alternatively hard anodised aluminium can work well or a good quality powder coated finish can be more economical. It is true to say that with modern technology it is now possible to illuminate an entire garden with the equivalent of a 60 watt incandescent bulb. Whether the decision is made to light the exterior entirely by dedicated LEDs or a mixture of light sources will rather depend on budget and logistical factors such as the placement of drivers and transformers. Mains fittings offer more flexibility and combine well with retro fit LED lamps although for smaller punchier lights LEDs are general the best choice. Fibre optics can also look magical when combined with water features and, once in situ will last for years although your electrician will not love you for specifying them. Ideally there should never be less than two control circuits, three being the optimum and a fourth giving prime flexibility. The first will be atmospheric lighting close to the house, the second will be security and facility lighting (this will often be on a PIR with a timer and over-ride facility), and the third will generally be for landscaping beyond the immediate vicinity of the house, such as driveways and additional features. The luxury of the fourth can allow for an entertaining circuit such as illuminating a barbeque and dining area, swimming pool or hot tub if such indulgences exist. Lighting a garden can be a functional exercise or an exciting adventure which will add a totally new dimension to a property. There’s no quick fix solution to creating it but with careful consideration and measured planning the effect can be a work of art. It’s a matter of choice.